The CDR 840 Drive HD dash cam from Cobra Electronics features a compact design loaded with 1080p HD video recording. It has an inbuilt GPS, making it possible to stamp the exact time and location in the recording. 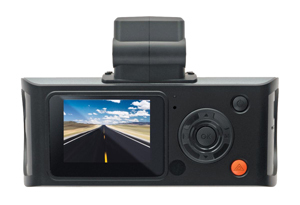 Whether you are looking to record the evidence or some other great stuff on the way while driving, this professional quality dash cam will never let you down. The camera comes with one year warranty from the manufacturer. 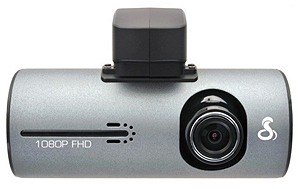 Full HD Recording: The dash cam offers 1080P full HD video recording at a resolution of 1920×1080. A memory card of 8GB is already installed in the camera so that you can start using it right away. Powerful sensors: While a powerful motion sensor triggers automatic recording as your car starts moving, a G-Sensor watches out for sudden jerks, collisions and acceleration so that no accident goes unrecorded. Wide Viewing Angle: The camera has a wide viewing angle of 118 degrees and it is capable of clearly recording license plates even at long distances. Internal GPS: Thanks to the built-in GPS technology, your recording is automatically embedded with exact time and location by the dashcam. You can view the geo and G-Sensor info even on your PC or HDTV using a freely available PC application. Loop Recording: The camera features continuous loop recording. When the space in the memory card gets exhausted, it automatically starts overwriting the oldest clip. Thus, you don’t worry have to worry about the cam stopping to function due to lack of storage space. Display and Playback: In addition to the LCD monitor of 1.5 inches, you can also play back the recordings on your computer and TV. You can either use your system’s media player or company’s HD player for this purpose. When you connect the cam to your computer, you will get an options menu. Choose the option depending upon what you want to do (e.g. connect as a storage device, etc.) and you are good to go. Installation: You’ll find 8GB MicroSD card accompanying the camera. Be careful not to lose it while unpacking the cam since the card is very small in size. Attach the mount to the cam by sliding it over and fixing it with a screw and a knob. Then move on to attach it to your vehicle’s windshield by pushing the suction cup against it, followed by flipping the lever to lock it. Finally, plug in to power and you are all done. Size: 6.00in. x 5.50in. x 3.50in. The sound and picture quality of this cam is outstanding. Street signs and traffic in front of you are clearly visible even during night time. The setup process too is easy. I’m glad to recommend it to my readers.